It's a feast of the senses; a teaser to return and stay a-while; a place to get ideas of where to eat next and a reminder of a delicious or memorable experience in this small, magical, culinary oasis of Yountville. 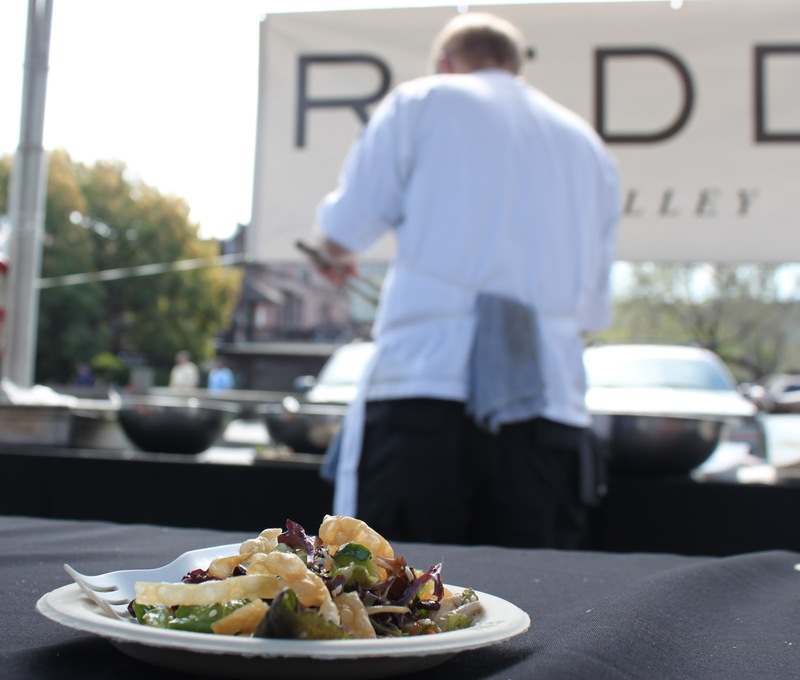 It's a place to absorb the eclectic, yet family-like atmosphere, a gathering of gastronomic minds of all walks, of winemakers, artists, artisans and musicians, all radiating from within or around the town. It is Taste of Yountville! 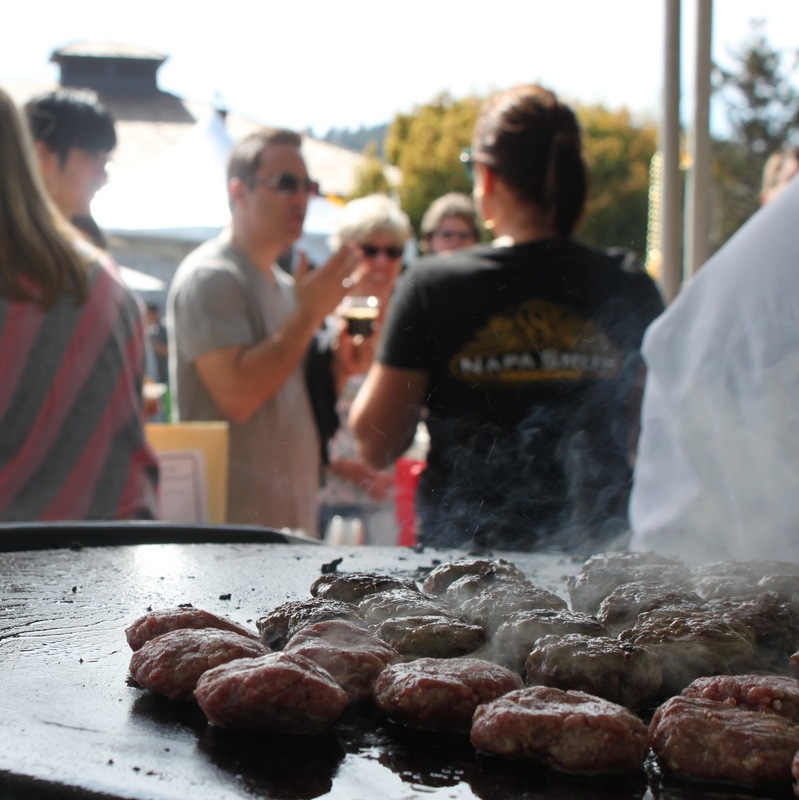 Visitors from other cities, states and countries, not to mention the locals, came and were treated to samplings from the town's restaurants, wineries (and other beverage makers) and artisans. For a town so small, it also presented a display of world class artwork. 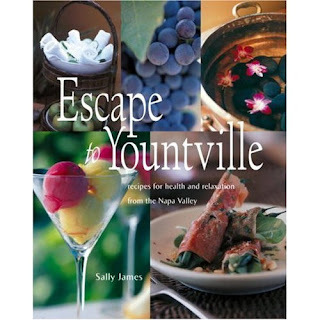 Whether you're local or thinking of visiting, here's my selection of the town's offerings from the festival to inspire you where to eat, stay, drink and just enjoy life as a "Yount-villain". Where better to start than the first fine dining establishment in the town, Etoile at Domaine Chandon, where Chef Perry Hoffman had prepared samplings of house made Duck Pate crostini with poached rhubarb, to pair with their signature bubbles! 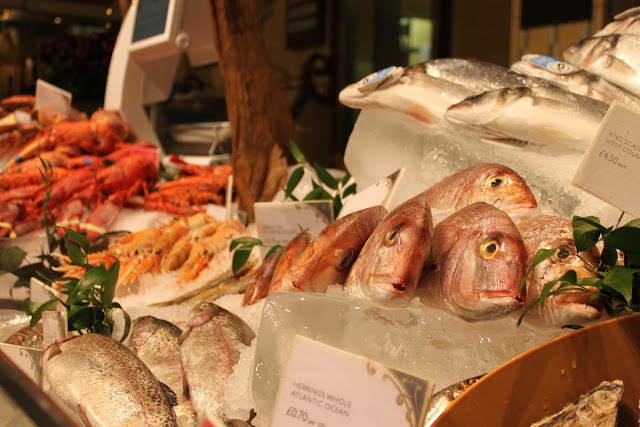 The picture of dinner here is huge glass windows looking over vineyards and glorious landscaped grounds - waterway, sculpture and ducks included, while having your taste buds seduced by the fresh, seasonal, creative and playful cuisine of the chef. 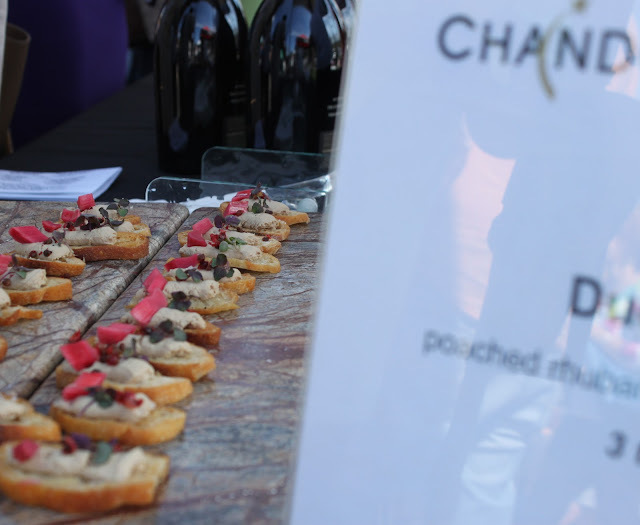 Pair that with the wonderful bubbles produced from the vines and you have yourself an evening to remember! 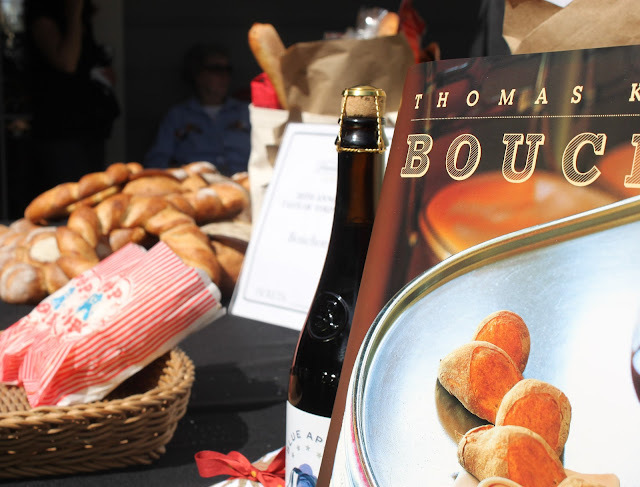 A taste of Yountville wouldn't be complete with offerings from the towns internationally renowned, Thomas Keller, whose presence was felt in more ways than one - a delicious sampling of truffle popcorn, home made chocolates and their scrumptious Parisienne-style baguettes! from Bouchon Bakery. The lines of chatting, excited patrons decorating the bakeries pavement is just one testament to the wonders inside! Personally, I love nothing more (and do quite frequently) that sitting at the bar at Bouchon Bistro sipping French wine and slowly sampling my way through their regional oysters, crab and prawns! 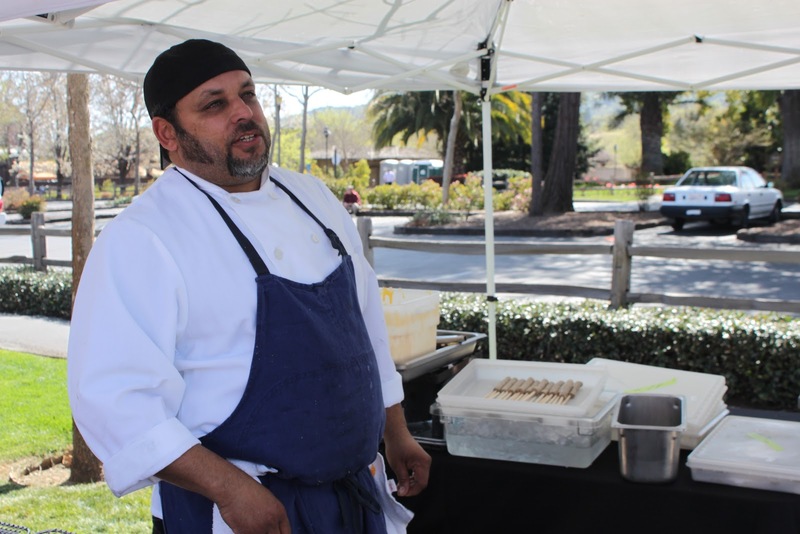 Others gravitate to the warm hospitality and family-style dishes of Ad Hoc - whatever your palate or occasion, Thomas has something for you in Yountville. 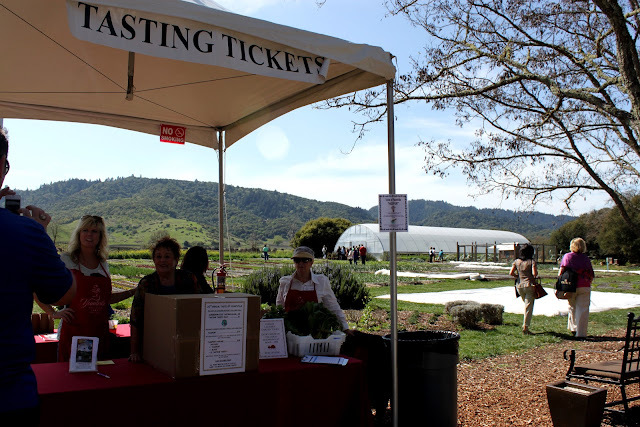 Those after a more active pursuit, or perhaps to burn off tastings-between-tastings, were able to enjoy a guided tour through the French Laundry expansive gardens and green house. This magnificent spread of lush vegetation is where the restaurant derives much of it's produce, and where the chefs learn to embrace a plant from the seed to the plate! Richard Reddington, of Redd serving updated interpretation of wine country cuisine with influences from Asia, Europe, and Mexico in a relaxed yet elegant environment, and the more casual Redd Wood gracing the northern end of town (NoYo) with a divine wood fired pizza and stylish Italian selection. 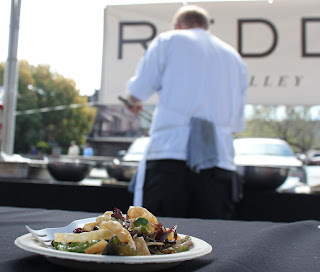 It was an inspired and stylish Chinese Chicken Salad that tempted diners at Taste of Yountville. The backdrop to the town's east side was two of the towns most charming hotels, Villagio Inn & Spa with a luxuriously rustic Tuscan elegance, and the Vintage Inn, with a French Country feel - both terrific choices when you visit! And, not to forget, the gloriously restored V Marketplace, a building dating back to 1870 that now houses a range of clothing, artists, home accessories, jewellery, chocolatier, Kollar Chocolates, and The V Wine Cellar. 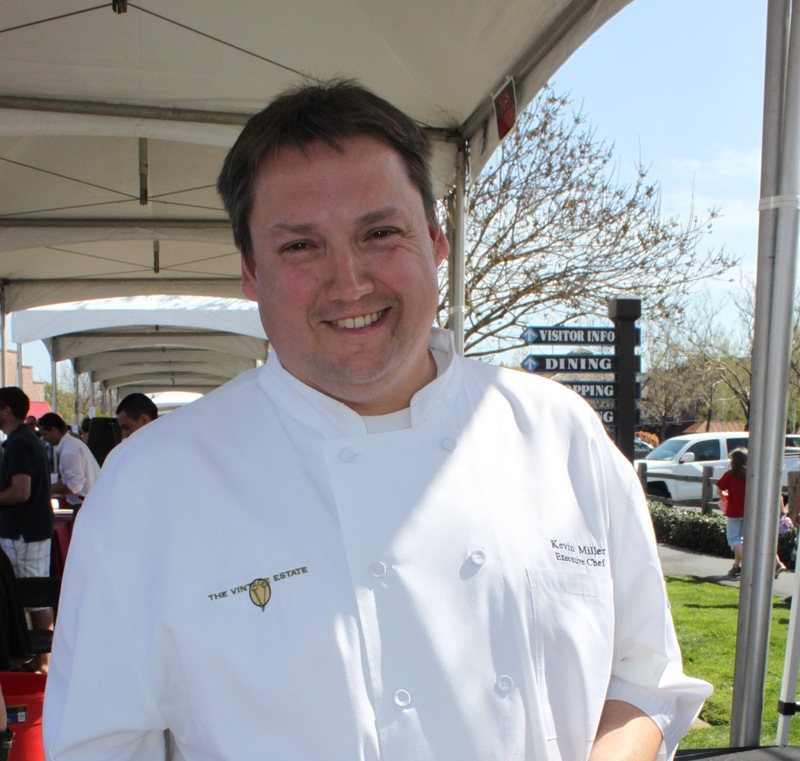 Michael Chiarello's Bottega and Napa Style adorn the rear and side of the marketplace, where diners flock for some of the valley's best Italian food with California sensibilities! Kollar Chocolates, whose beautifully designed store (by architect Amy Fechter) nestled in the front of V Marketplace, are sought after for their stunning creations and unique flavors. 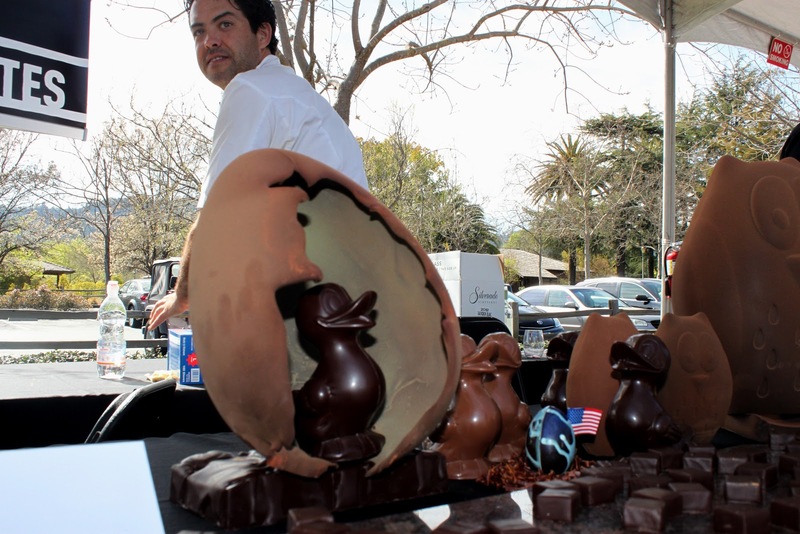 Chris Kollar focused on Easter and local red wine for the festival with bountiful bunnies and morish red wine truffles! 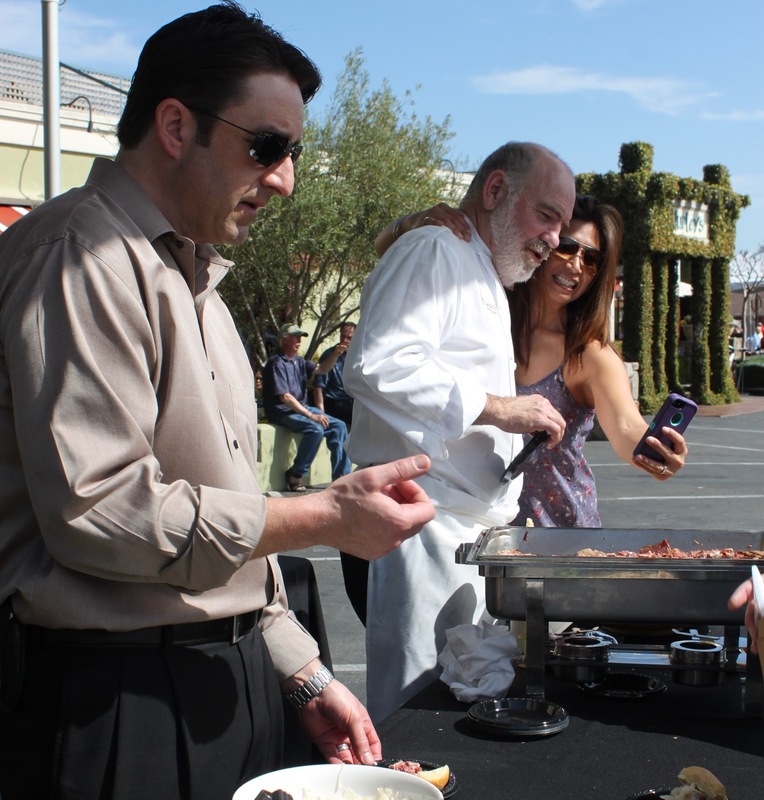 The Vintage Estate's Executive Chef Kevin Miller whips up the best breakfast presentation (complimentary) in the country, not to mention unforgettable wedding feasts, and a really great room service and poolside selection! 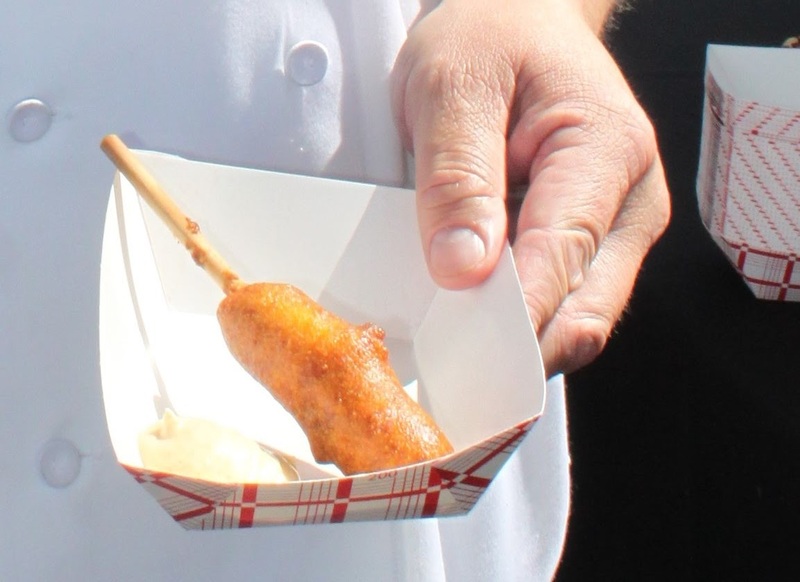 To delight the hungry audience at the Taste, Kevin (above) and Yountville "charceuteriere-extroadinaire" (excuse my liberty with Webster's), Chef CT (below) had whipped up Cajun Corndogs, enshrouding Chorizo sausage in a succulently crisp Hushpuppie batter! On the far north end of town, Brix sits amongst a huge kitchen garden, and brings French inspired California cuisine to the table, with an expansive open kitchen and gorgeous patio for dining. 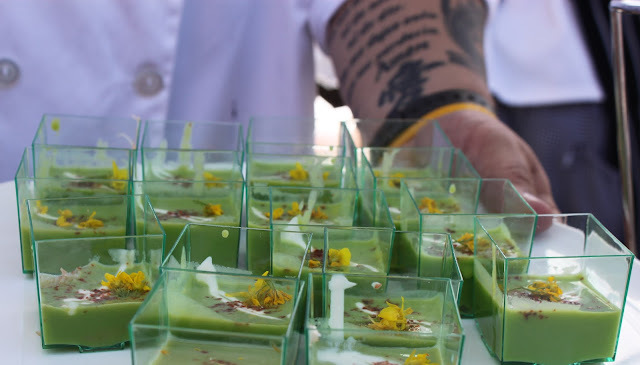 Their contribution to the party were these delicate Chilled Spring Pea soups with Crab and Mustard Blossoms, echoing the blossoms and blanket of mustard through the vineyards that has come with the early onset of spring. 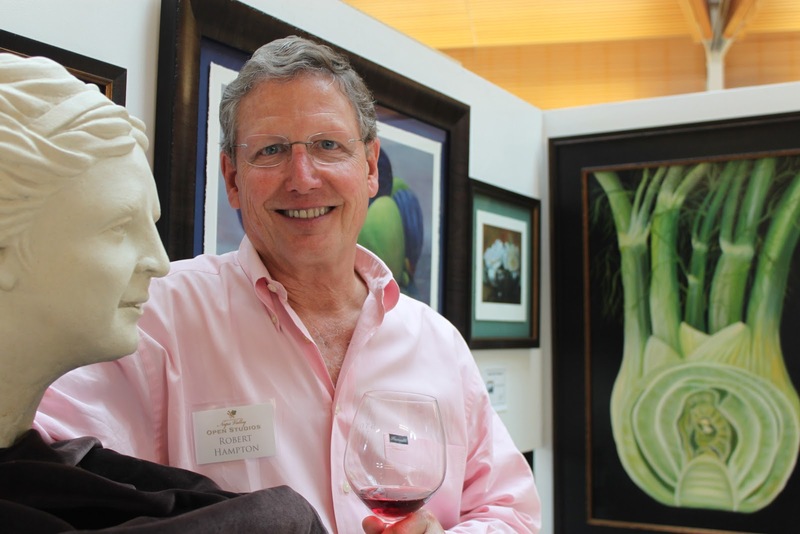 The artist lovers weren't disappointed with the amazing quality of paintings, sculptures and creations as part of the Napa Valley art festival that the town Incorporated. The highlight for me was Rob Hampton's presentings. 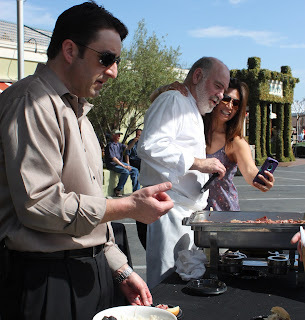 He is not only town dentist, but the true example of a Renaissance man - artist, particularly culinary art, sculptor, chef, cellist and probably more to that bow! Here is a sampling to finish like the perfect dessert!